What do you guys use to keep the sweat out of your eyes on humid mornings like today? it's humid in AZ? FL in summer is brutal and nothing really works. However, I do like the Halo headbands. I've found that washing your removable padding regularly helps....most likely because once it becomes saturated with oils and salts it can't absorb as much. Having said that...there's not much you can do on a really muggy August morning in PHX except keep moving. Not in Arizona, but in Kansas City on hot humid days, just have to take stops and wipe the sweat out of the headband. Every 15-20 minutes. I use this, but still have to wring it out at least once these days. I don't have much hair and prefer it to just the headbands. i use a halo, and a sweatbuster that fits inside the helmet. using both works. Sweat Gutter. I'm bald and sweat a lot it's great to keep the sweat out of your eyes. It doesn't stop your sweat just diverts it off to sides. About $17 at Performance. Only thing I don't like is sometimes you hit a bump on downhills it will drain into your eyes rather than off the sides but nothing terrible. Use Rogaine to grow a extra thick monobrow. Amazon here I come... Thanks guys! The Halo works well for me in the humid Midwest. I wear a cycling headband all riding days of the year. 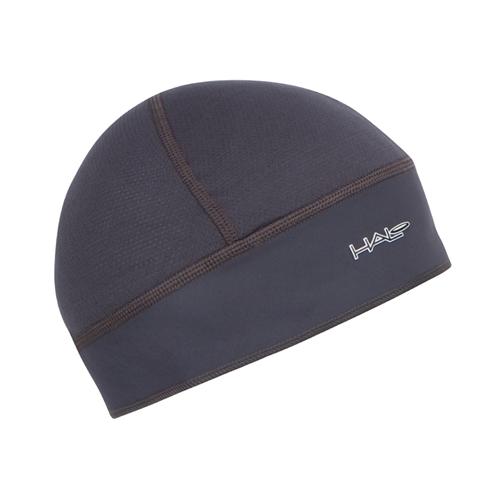 It's made of neoprene and has ear coverings if you flip it over for Winter riding. ever let your gloves get go sweated up that the next day they are rock hard and will stand upright on their own? I probably don't ride as hard as you but I really don't get sweat in my eyes until I stop. I think my helmet pads catches whatever little bit there is while I'm riding. Halo band is the way to go. Keeps the sweat off my glasses. Just don't drink water and you won't sweat. I bought one of those halo caps and found it too hot, I cut out the center and made it a headband. Works well now. I use the Halo caps like Joe showed above. Still need to wring it occasionally. It keeps the sweat out of my eyes unless it is loaded up and I happen to look down. Usually when stopped and I look down to grab my bottle or I'm digging something out of my pack. Bonus is that since I keep my hair really short (buzzed with no guard) it keeps my head from getting sunburned. Nothing like helmet vent sized patches of sunburned skin to make someone think you have a disease. fyi, Halo also sells a headband product. same as what you did--has top cut out but it may velcro round head? The Halo was a revelation for me but I found it was overwhelmed pretty easily on humid days. Saw a thread on sweatbuster on MTBR, now use it and Halo, with helmet liner removed. even in high 90s and high humidity in Virginia, this combo does the trick, no more sweat in the eyes. if your helmet is borderline too small for you could find it challenging to use both. I use these cheap headbands from Target. They work pretty good most of the time but I do carry a spare and hafta switch them out every once in a while if it is humid. Have to admit that it's much improved over the stock sweat pads. Like their claim states, I also feel that it should've been included into the helmet from the factory. I live in an inland desert valley area, with boulders in place of trees, soaking up all the sun's heat (not to mention all the bare asphalt and concrete), not too unlike your climate. Living next to a lake, and within a culture that likes lawns and use sprinklers, doesn't help the humidity issue. Well, there's always goggles if you insist on riding humid mornings and have a problem with sweat in your eyes, or just install weather stripping behind the top rim of your eyewear. Second for the Sweat GUTR. Been using the Halo for about a week now and it works pretty well. I may cut the cap part off as someone else stated they had. I like the breeze on my bald head when moving. I had my sweat glands removed, was getting tired of sweating - problem solved. How do you address the new problem of being unable to regulate body temperature? Halo headband AND Sweat Buster pad in the helmet. The combination works except on the hottest or most humid days. Where do got get the sweat buster? If Bell is following this thread maybe they will come out with a "No Sweat" "Maxi-Pad" lined Helmet, with complimentary Halo accessory. Halo sweatband and cut strips of thin feminine pads stuck inside around and to the helmet pads. best way to keep sweat out of my eyes? Sweat in the Eyes ... How do YOU stop It?